Akiyama and Afanasyev before flight. Mir Expedition EO-8. crew of V M Afanasyev, M Kh Manarov was transported to the Mir orbital station by Soyuz TM-11, together with T Akiyama (Japan) for the purpose of carrying out joint work with the cosmonauts G M Manakov and G M Strekalov. The launch was funded jointly with the private Japanese company TBS. The Japanese television network ended up paying $ 28 million for the first commercial flight to Mir to put Akiyama, the first journalist in space aboard Soyuz TM-11. 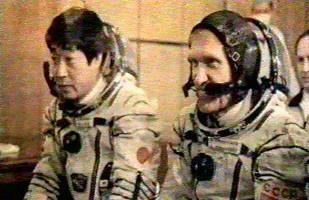 Akiyama returned to earth on Soyuz TM-10 with the Mir EO-7 crew after a week in space. AKA: Derbent (Derbent - Russian city);Mir EO-8;Soyuz TM-11 (Afanasyev, Manarov). Launched: 1990-12-02. Returned: 1991-05-26. Number crew: 2 . Duration: 175.08 days. The Mir Expedition EO-8 crew of V M Afanasyev, M Kh Manarov was transported to the Mir orbital station by Soyuz TM-11, together with T Akiyama (Japan) for the purpose of carrying out joint work with the cosmonauts G M Manakov and G M Strekalov. The launch was funded jointly with the private Japanese company TBS. The Japanese television network ended up paying $ 28 million for the first commercial flight to Mir to put Akiyama, the first journalist in space aboard Soyuz TM-11. Akiyama returned to earth on Soyuz TM-10 with the Mir EO-7 crew after a week in space. Soyuz TM-11 docked with Mir on 4 December, 1990. The EO-8 crew of Viktor Afanasyev, Musa Manarov (on his second Mir visit), together with Japanese television journalist Toyohiro Akiyama were welcomed aboard Mir by the EO-7 crew. Akiyama's network, the Tokyo Broadcasting System (TBS), paid for the flight. The Soviets called this their first commercial spaceflight and claimed to have earned $14 million. The journalist was scheduled to make one 10-min TV broadcast and two 20-min radio broadcasts each day. Electrical power and video and TV system incompatibilities forced the Japanese to make extensive use of converters. His equipment, which weighed about 170 kg, was delivered by Progress M-spacecraft and set up in advance by Manakov and Strekalov. On December 5 Akiyama's couch was transferred to Soyuz TM-10. On December 8 Manakov and Strekalov commenced loading Soyuz TM-10's descent module with film and experiment results. TBS broadcast the landing of the EO-7 crew and Akiyama landing live from Kazakhstan. 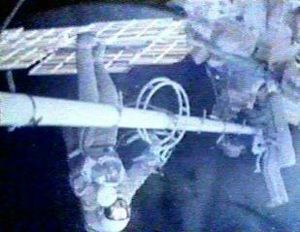 On January 4, 1991 Afanasyev and Manarov prepared their spacesuits for an EVA to repair the Kristall EVA hatch hinge damaged by Solovyov and Balandin in July 1990. They suited up and practiced in the Kvant 2 airlock. On January 7 the EO-8 crew opened Kvant 2's EVA hatch and clambered outside. They repaired the damaged hinge, tested their handiwork by closing and sealing the hatch, then reopened the hatch and went about other tasks. These included transfer outside the station of equipment scheduled for installation on later EVAs. They also removed a TV camera from Kvant 2 for repairs inside the station. The EVA lasted 5 hr, 18 min. On January 23 the EO-8 crew opened the newly-repaired hatch and slowly transferred a carton 6 m long to a worksite on the base block. The container held Strela, a folded boom with a pivot mechanism at its base. They attached Strela to supports which originally held the base block's launch faring. The 45-kg boom was meant to play a key role in the transfer of Kristall's twin 500-kg collapsible solar arrays to the sides of Kvant. Maximum boom length was 14 m; maximum capacity, up to 700 kg. The EVA lasted 5 hr, 33 min. On January 26 the EO-8 crew spent 6 hr, 20 min installing support structures on Kvant. They were meant to hold the Kristall solar arrays. February 19 marked the fifth anniversary of Mir's launch. The EO-8 crew spent February working with materials science apparatus in Kristall. They used the Pion unit to study the effects on semiconductor production of changing patterns of microacceleration aboard Mir caused by operation of its equipment. On March 7 the cosmonauts extended a pole bearing a magnetic sensor through a Mir scientific airlock as part of the Diagramma program to characterize the environment outside the station. Observing the Gulf War. Afanasyev and Manarov could easily see evidence of war as they passed over the Persian Gulf. They sent back TV images of oil spills, smoke pouring from a coastal town, and fires. On March 21, as Progress M-7 approached the station, it broke off its approach 500 m from the aft docking port. On March 23 the craft made a second approach, but 20 m from the rear port a controller in the TsUP detected a "catastrophic error" and broke off the approach. Progress M-7 passed within 5 to 7 m of the station, narrowly avoiding antennas and solar arrays. The cargo ship was left in orbit near the station while the problem was worked on. To diagnose the Progress M-7 problem, Afanaseyev and Manarov undocked Soyuz TM-11 from the front port on March 26 and transferred it to the aft. During approach to the aft port, they used Kurs, rather than carrying out the transfer under manual control, as was typical. They found that their spacecraft mimicked Progress M-7's behavior, veering away from the docking port. The cosmonauts completed a normal manual docking at the aft port, having determined that the problem was in Mir's aft port Kurs antenna. On March 28, Progress-M 7 docked at Mir's front port. If it had failed to dock, the cosmonauts might have had to draw on a one month reserve of emergency supplies while a standby Progress was readied. On April 25 Manarov filmed the damaged Kvant Kurs antenna. He reported that one of its dishes was missing. During the EVA the cosmonauts also replaced the camera they had removed from Kvant 2 on their first EVA and repaired inside Mir. The EVA lasted 3 hr, 34 min. On May 20, the EO-8 crew welcomed aboard Mir the EO-9 crew of Anatoli Artsebarski and Sergei Krikalev (on his second visit to the station), accompanied by British cosmonaut-researcher Helen Sharman. Sharman was aboard as part of Project Juno, a cooperative venture partly sponsored by British private enterprise. Sharman's experimental program, which was designed by the Soviets, leaned heavily toward life sciences. A bag of 250,000 pansy seeds was placed in the Kvant 2 EVA airlock, a compartment not as protected from cosmic radiation as other Mir compartments. Sharman also contacted nine British schools by radio and conducted high-temperature superconductor experiments with the Elektropograph-7K device. 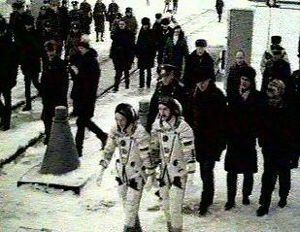 Sharman commented that she had difficulty finding equipment on Mir as there was a great deal more equipment than in the trainer in the cosmonaut city of Zvezdny Gorodok. Krikalev commented that, while Mir had more modules than it had had the first time he lived on board, it did not seem less crowded, as it contained more equipment. Krikalev also noted that some of the materials making up the station's exterior had faded and lost color, but that this had had no impact on the station's operation. During a communication session with a British girls' school on May 21, Sharman commented that Mir was experiencing solar array problems because of the station's changing orientation. Late that day the level of background noise on the station suddenly fell from the customary 75 decibels as fans, circulating pumps, and other equipment shut down. The lights began to fade. A computer in the orientation system had failed, preventing the solar arrays from tracking on the Sun, and causing Mir to drain its batteries. Sharman stated that Afanaseyev and Manarov told her such power problems had occurred before. When it reentered sunlight, the station was turned to recharge its batteries. The EO-8 crew returned uneventfully to earth on May 26 with Sharman. Family: Manned spaceflight. People: Afanasyev, Manarov. Spacecraft: Soyuz TM. Afanasyev and Manarov walk to launch vehicle. 1990 December 10 - . Landing of Soyuz TM-10 - . Return Crew: Akiyama, Manakov, Strekalov. Nation: Russia. Related Persons: Akiyama, Manakov, Strekalov. Program: Mir. Flight: Soyuz TM-10, Soyuz TM-11, Soyuz TM-11 Kosmoreporter. Soyuz TM-10 landed at 06:07 GMT, 69 km NW Arkalyk, with the crew of Akiyama, Manakov and Strekalov aboard..
1991 January 7 - . 17:03 GMT - . EVA Mir EO-8-1 - . Crew: Afanasyev, Manarov. EVA Duration: 0.22 days. Nation: Russia. Related Persons: Afanasyev, Manarov. Program: Mir. Class: Manned. Type: Manned space station. Flight: Soyuz TM-11. Spacecraft: Mir. Completed repair of Kvant 2 hatch..
1991 January 23 - . 10:59 GMT - . EVA Mir EO-8-2 - . Crew: Afanasyev, Manarov. EVA Duration: 0.23 days. Nation: Russia. Related Persons: Afanasyev, Manarov. Program: Mir. Class: Manned. Type: Manned space station. Flight: Soyuz TM-11. Spacecraft: Mir. Installed Strela boom on Mir..
1991 January 26 - . 09:00 GMT - . EVA Mir EO-8-3 - . Crew: Afanasyev, Manarov. EVA Duration: 0.26 days. Nation: Russia. Related Persons: Afanasyev, Manarov. Program: Mir. Class: Manned. Type: Manned space station. Flight: Soyuz TM-11. Spacecraft: Mir. Installed solar array supports..
1991 April 26 - . 20:29 GMT - . EVA Mir EO-8-4 - . Crew: Afanasyev, Manarov. EVA Duration: 0.15 days. Nation: Russia. Related Persons: Afanasyev, Manarov. Program: Mir. Class: Manned. Type: Manned space station. Flight: Soyuz TM-11. Spacecraft: Mir. Inspected Kurs docking system antenna..